London is a not only an incredibly beautiful city but it is a very big and daunting one too! Tourists may sometimes find themselves lost trying to navigate their way through its numerous streets or tear their hair out trying to figure out a route on public transport. With so many people and such a huge area, even Londoners can sometimes get lost or take the wrong bus, tube or train! Now imagine that you have newly arrived in the Capital and have to work your way around it. For most, this would be exceptionally challenging, if not impossible. So I would like to share with you a story about one of our new cleaners. Many of our cleaners are not from the UK, and some of them don’t yet speak the language but they want to work and this may be the only job they can get. Our cleaner, Malinka, had only been in London for four weeks and was booked to start cleaning for one of our regular commercial client’s property (pub). This client requires the cleaning tasks to be completed by 9.00am so the cleaner has to start work in their home as early as 6.00am. This meant Malinka needed to use the Night Bus. Although she had only recently joined our company, she had proven to be a very diligent and conscientious person. We knew she hated being late for her work and always ensured she got to jobs on time. She manages this despite not being totally familiar with London Transport. Unfortunately on this day, she inadvertently missed her stop and then found herself not knowing what to do. After calling our Supervisor and getting directions with the help of the bus driver, she got off at the next stop and waited for another bus to take her to where she needed to be. Now what happened next has restored our faith in humanity and the people of this great city. The bus driver could see Malinka was distressed and very worried. He has just reached the end of his shift and drove back to the stop where she was waiting. He saw her still there, tearful and probably scared so he pulled over with the bus. He managed to communicate with her to get her to call our supervisor so he could explain what he was going to do. Although he did not really need to do anything, he took time out of his precious day to then drive her to the address and upon arrival explained to our client what had happened. We were delighted and immensely humbled when hearing this story from Malinka. It made us realise that Londoners are really and truly helpful people with big hearts. 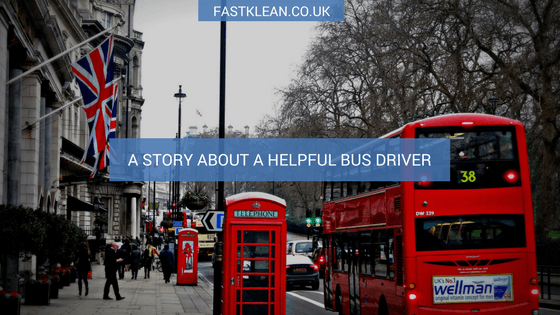 This bus driver went out of his way to help a foreigner in trouble. She was so thankful to this man that the next time she saw him driving her bus, she gave him the gift we had bought for him to say “Thank You”. Although we do not know his name, we hope more people will show the humanity and kindness he did. Surely this would make the world a better place?